The story of Cambodia’s genocidal Khmer Rouge regime is conceivably the most shocking of the post-WWII era, given the scale of organised horror. Cruel zealots lead by Pol Pot attempted to re-model society. Phnom Penh residents were forced into the countryside to become labourers in a new communistic, agrarian revolution; educated and professional people were simply killed en masse, often identified by their wearing of glasses; and much worse. It lasted three years, eight months and twenty days, 1975-78, until invading Vietnamese forces freed the country from its persecution. Death toll 1.7 million. In Phnom Penh prisoners were starved, tortured for false confessions and then killed in an old school called S-21 or Tuol Sleng. When numbers grew too large they were sent to the outskirts of the city and brutally slain, often with an axe blow to the head, including children – this became the notorious killing fields. Both sites can be visited today and feature in tourist guide books. 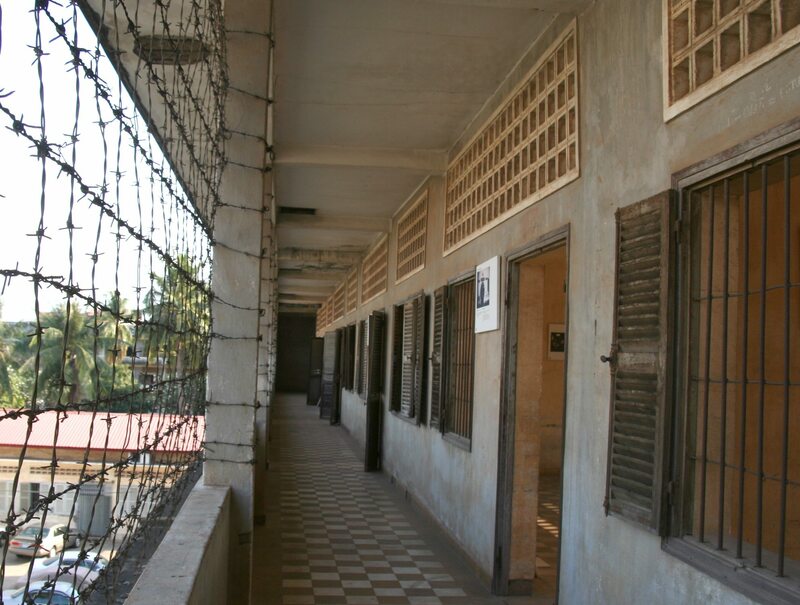 Gruesome remains at Tuol Sleng have been cleaned up in recent years, but it’s still a harrowing experience to go through old classrooms used as torture cells, hanging posts, etc. Photos & documents are on display along with explicit paintings of torture by Vann Nath, one of the few survivors from 14-17,000 prisoners killed. Spared because of his painting skills, he was put to work by the cruel Duch, in charge of Tuol Sleng. Traumatised Vann Nath kept painting after his release, and he and his paintings became symbols of survival in that blighted country. Sadly he died recently at age 66, from illness caused by his imprisonment. Pol Pot is dead but other Khmer Rouge leaders have escaped justice to date. Four are presently on trial in a special UN-sponsored tribunal grinding on in Phnom Penh, which the current government has tried to obstruct, as some of its members share guilt as Khmer Rouge cadres. Vann Nath testified to the tribunal in 2009 against Duch, and saw him sentenced to 35 years in prison. The complicit role of Western powers in recognising the Khmer Rouge government is a monumental scandal of Cold War politics, as is the land mine legacy from US bombing during the Vietnam war covering vast tracts today. Cambodia is a deeply troubled country with resilience tested to its limits.